IPL is a non- invasive technology , not only can you treat the entire face but the neck, arms, hands, chest, back etc. – i. e. risky areas for laser therapy. The patient can reserve all regular activities immediately after treatment. 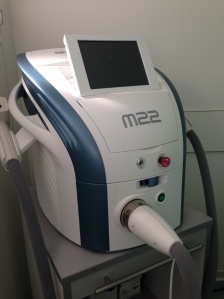 Leg veins and reticular varices can be treated by using IPL with special Nd:YAG laser handpiece.